teriiehina's blog - How coupled are your classes ? So, what is, formally, a coupling ? Of course, one will go to Wikipedia's page «Coupling (Computer programming)» to have a first answer. But maybe we can try to search on our own. For the moment, we will try to modularize on a screen basis, i.e. to move each screen into its own pod. Thus what we want to know is how much "link" there is between a screen and the others modules of the application. From the outside, this seems nice and clean but maybe not. So how to measure how entagled our code is. 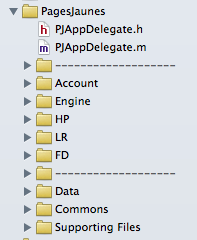 A possible start would be to list all the #import of headers which are not in the same module as the importing file. find . -name ". [hm]" | xargs cat | grep "#import"
So in the HP module, we import 120 headers. 106 of those aren't in the module.